It began with the Visitor Center. I'm not quite up to bringing down the House today. When the walls returned to my inventory, I took a last look at the fireplace. I think I've done a decent job with my own in OpenSim. Goodbye, fireplace. Get into that folder, ravens! And take that skull and bones with you. Slide show and student projects, in you go! I think I've done enough. I'll leave the House up a little longer if you want to see it. TP to the site of the Visitor's Center, hop in the balloon, and look around. I'll be pulling down the House next week. The entire island will vanish by the end of the month, as our university ceases any operations in Second Life. After that, you'll want to visit Jokaydia Grid to see the new version of this simulation. 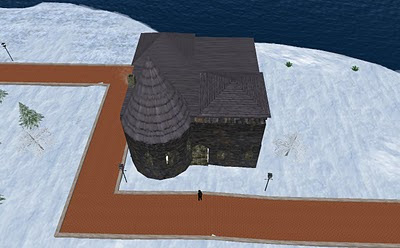 I plan to set up a little center for pedagogy on Nevermore Island, dedicated to the hard work my students in SL did. In 2011-12, after a pause caused by Linden Lab's price hike for educators and the resultant rebuilding, I'll return to OpenSim with a batch of first-year students. My first-years this semester will have the option to explore a game or virtual world for final projects, in a class about the history, culture, and future of cyberspace. But there will be no required work in SL. Never again, I anticipate. 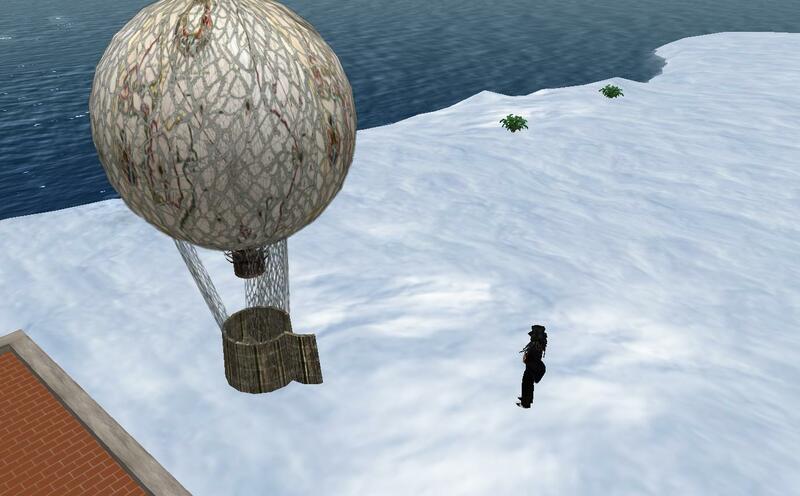 If a student chooses to explore Linden Lab's grid, I'll be on hand to mentor him or her. But beyond that, my efforts will be elsewhere.